Indiana is blessed with an abundance of farmland, yet > 90% of our food is grown elsewhere and many Hoosiers struggle to find enough to eat. 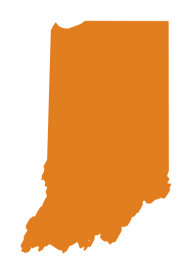 12 percent of households in Indiana struggle to put food on the table. Proper nutrition is vital to the growth and development of children. Research indicates that even mild under-nutrition experienced by children during critical periods of growth impacts behavior, school performance, and their overall cognitive development. _ Carin (not her real name) and her family seem to fit the category of the ‘working poor’. Carin’s first husband died. Remarried now, she cares for two young children. Her husband works full time but in a minimum wage job. She did not finish high school and when last she worked she too was working for minimum wage. As a veteran her husband receives VA medical benefits, which is a good thing since his job does not include any benefits. Even with the assistance of SNAP and school lunch for the kids they are on the edge. They do not have a telephone or access to a working car. The kids always eat but she and her husband sometimes forgo food for as long as a whole day to assure there is food for the children. 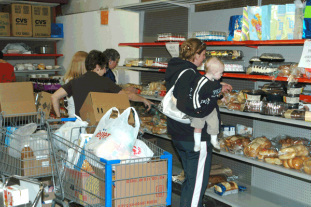 Thus she visits a church food pantry in Indianapolis once a month. They are on the edge but with public and private help Carin can feed her family.